In the “hood,” people wake up to all sorts of noises. Some wake up to gunshots and police sirens, while others wake up to their mothers or spouses yelling. Back in the early 70’s, however, young Gilberto Gonzalez would rise and shine to the sound and rhythm of Latin music being played by his neighbors at a nearby park. “I would hear the pounding of congas and their harmonizing voices as they sang Spanish songs from Puerto Rico,” Gonzalez, now 50, said. This is one of Gonzalez’s fondest recollections growing up on 20th and Green, but something he explicitly remembers is who those neighbors were and what they did for the community. “They kept us safe from the Blacks and Americanos who surrounded the neighborhood,” Gonzalez said. “They would stand in the corners and walk elders home, make sure children got to and back from school safely, and would even be out as late as midnight to make sure bar-goers weren’t mugged. I looked up to them as a kid,” Gonzalez recalled. Being surrounded and outnumbered by other ethnic groups made the Latino neighborhood easy targets. The film focuses on the origin of the Puerto Rican gang. 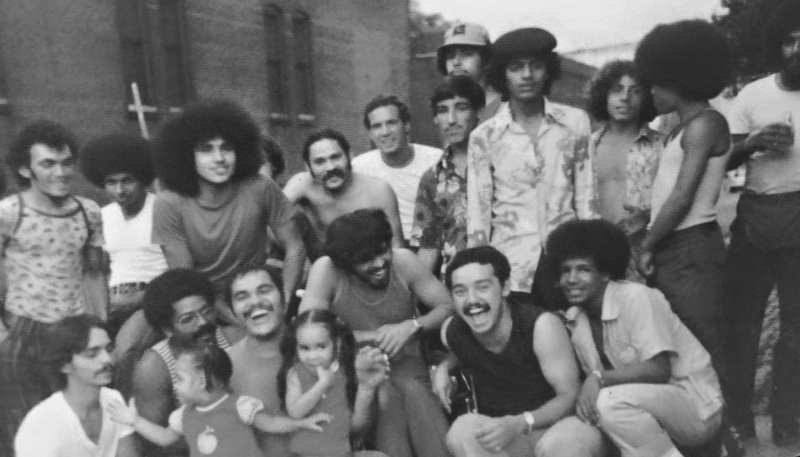 It also features testimony from some of the original 20G members who defended their neighborhood from other gangs and the police during a racially-divisive 1970’s in the barrio of North Philly. Although it is not clear when they originated, the gang’s activities were recorded as far back as the 1950’s. Their territory ran from 16th to 20th and Green street—hence, the group’s name, 20G. Their enclave, occupied by Hispanic families, was just a small fraction of the 87 acre Spring Garden community. Being surrounded and outnumbered by other ethnic groups made the Latino neighborhood easy targets, remembers Gaucho, who’s been a 20G member for 45 years. “We were labeled and singled out by everyone around us; white people would call us some nasty names, Black people would mug us, and the police would beat us down instead of protecting us,” he said. Fed up with being powerless and voiceless in their community, a group of Puerto Ricans banded together and formed the 20G—pronounced two-oh-gee— to be resilient during a time of pushback. To join the gang, one had to be from the neighborhood and understand the cause that the 20G were fighting for. “We we weren’t a typical gang, and that’s the first thing we let people know, we’re simply law-abiding citizens demanding respect and eliminating negativity,” Gaucho said. In order to prove they had heart and prepare them for the inevitable physical altercations to come, the individual would have to endure a beat down by members of the pack—a common form of initiation among gangs. Surely, it wasn’t long before large fights would break out between the 20G and other groups—especially the police. “We learned to hate the 9th District cops [at the time]. Other than abusing us, they would lock us up assuming we were drug dealers since we would stand in the corners,” Sunshine said. Gonzalez, an award-winning senior designer at The Community College of Philadelphia (CCP), grew up in the 20G era, so he would often see the gang action. He remembers one scarring incident that established the group’s role as heroes in his life. Gonzalez also developed an affectionate relationship with the Latin gang as a kid. Some 20G members would babysit him and walk him to school. At one point, all Gonzalez wanted to do was be with them because they made him feel safe; and he knew the only way he could be with the gang was if he joined. However, the 20G didn’t recruit children. Gonzalez, a community activist, is no stranger to standing up for the Latino community. He’s protested against the closing of La Milagrosa, advocates for undocumented immigrant rights, and brings up a few social issues within the ‘20G’ film itself. “The 20G story provides a perspective on social issues such as gang violence, police brutality, drug abuse, and gentrification-- all of which are still relevant today,” he said. City Councilwoman Maria Quiñones-Sánchez, who helped produce the film, felt that the 20G’s little-known perseverant story was “necessary” to tell. “The value of the story speaks to the individual stories, forced gentrification, and public housing issues from the Puerto Ricans moving to the U.S.; it shows how underrepresented we are in the Philadelphia Housing Agency,” she said. At their peak, the 20G reached 300 members. Today, there are only 30 members left of the generational gang. Many of them left their Spring Garden homes and returned to Puerto Rico soil. Meanwhile, those who remain in the neighborhood, however, are still active in the community. Only this time, they’re taking a non-violent approach to make a difference. For the past few months, the 20G have been hosting parties and concerts to raise money for a scholarship fund they created. They will use it to send one of the neighborhood children to college or, at least, pay for textbooks. They hope the scholarship will serve as a motivation to keep the neighborhood children off the streets. While they hope to achieve their altruistic goals, the Latin group were commercially successful with their film. In its first public screening, the ‘20G’ documentary was shown at Scribe Video Center in February, and has received praise from viewers and critics. Dr. Iliana Pagán-Teitelbaum, an assistant professor of Latin American Film at West Chester University, was one of the first people to watch and review the film. "It captures a part of U.S. history that is rarely talked about, the existence of Puerto Rican communities for more than a hundred years here, the exclusion and violence against those communities, and the near total erasure of their presence and history in their old neighborhoods in Philadelphia," Pagán-Teitelbaum said. There will be a number of public screening of the award-winning documentary throughout the next few months. CCP and The University of the Arts are some of the venues to host the showcase. Despite the positive traction, the film’s purpose was to preserve the Latino history in Philadelphia, added Gonzalez. The 20G hopes the film’s narrative will allow viewers to disassociate the group with the negative “gang” stereotypes. Bert, a 20G who served as a consultant for the documentary, worked alongside Gonzalez to make sure the story was told right. The 20G, with nothing but their hearts-- filled with Boricua pride-- will continue representing their community until their last breath.